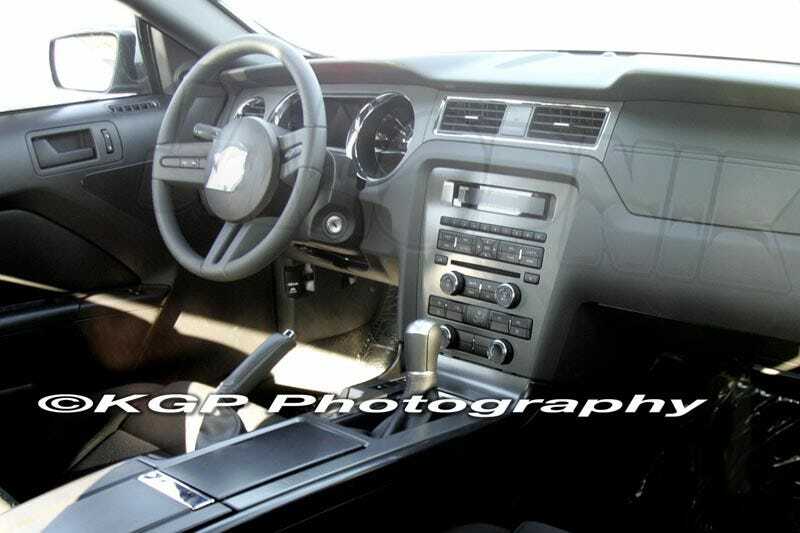 After getting a clearer look at the 2010 Ford Mustang GT500 yesterday, we just got these perfect spy shots in from the folks at KGP laying out the interior changes for the 2010 Ford Mustang. If you're having a hard time identifying the differences, don't be shocked, as they're subtle and evolutionary over the outgoing 2009 model. Given the rubber steering wheel, we're assuming this interior belongs to the base V6 model, but changes like the revised center stack, cleaned up emergency brake lever, new air vents and a side window defrost vent will be shared across all cars. It's also worth noting the ergonomic updates to the center stack, as the digital readout is now at the top of the pile, followed by presets and menu controls; the volume and tuning knobs are both analog knobs now (thank you Ford) and the HVAC controls move to the bottom. Door panels remain largely unchanged except for the speaker panel. The impressions of the spies and the reverse angle on the interior are below. We just got a new look inside the 2010 Mustang, and this prototype's dash was completely uncovered and uncamouflaged. This is the first time we've gotten a truly clean and unencumbered look at the new 'Stang's redesigned interior. The new dash design appears to utilize a number of the current Mustang's parts to save cost, but the main dash face, the center console, gauge-package, and steering wheel have all been restyled to give a more refined, upscale look while maintaining the simple, retro feel.